Whether or not there is an undiscovered planet lurking in the farthest reaches of the Solar System, the search for unknown dwarf planets and other objects continues. Extreme Trans-Neptunian objects (ETNOs) are of particular interest. The closest they come to the Sun is well beyond the orbit of Neptune, with the result that they have little gravitational interaction with the giant planets. Consider them as gravitational probes of what lies beyond the Kuiper Belt. Among the population of ETNOs are the most distant subclass, known as Inner Oort Cloud objects (IOCs), of which we now have three. Added to Sedna and 2012 VP113 comes 2015 TG387, discovered by Scott Sheppard (Carnegie Institution for Science), Chad Trujillo (Northern Arizona University) and David Tholen (University of Hawaiʻi). The object was first observed in 2015, leading to several years of follow-up observations necessary to obtain a good orbital fit. 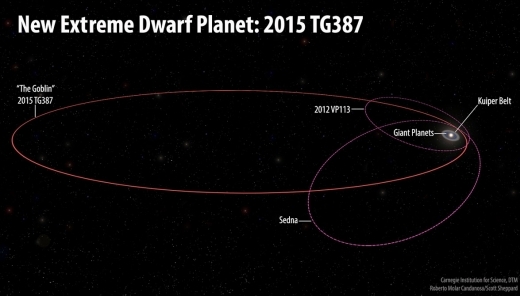 Image: The orbits of the new extreme dwarf planet 2015 TG387 and its fellow Inner Oort Cloud objects 2012 VP113 and Sedna, as compared with the rest of the Solar System. 2015 TG387 was nicknamed “The Goblin” by its discoverers, since its provisional designation contains “TG”, and the object was first seen around Halloween. Its orbit has a larger semi-major axis than both 2012 VP11 and Sedna, so it travels much farther from the Sun, out to 2300 AU. Credit: Roberto Molar Candanosa and Scott Sheppard / Carnegie Institution for Science. Perihelion, the closest distance this object gets to the Sun, is now calculated at roughly 65 AU, so we are dealing with an extremely elongated orbit. 2015 TG387 has, after VP113 and Sedna (80 and 76 AU respectively), the third most distant perihelion known, but it has a larger orbital semi-major axis, so its orbit carries it much further from the Sun than either, out to about 2,300 AU. At these distances, Inner Oort Cloud objects are all but isolated from the bulk of the Solar System’s mass. You may recall that it was Sheppard and Trujillo who discovered 2012 VP113 as well, triggering a flurry of investigation into the orbits of such worlds. The gravitational story is made clear by the fact that Sedna, 2012 VP113 and 2015 TG387 all approach perihelion in the same part of the sky, as do most known Extreme Trans-Neptunian objects, an indication that their orbits are being shaped by something in the outer system. Thus the continuing interest in so-called Planet X, a hypothetical world whose possible orbits were recently modeled by Trujillo and Nathan Kaib (University of Oklahoma). …Trujillo (2018) ran thousands of simulations of a possible distant planet using the orbital constraints put on this planet by Batygin and Brown (2016a). The simulations varied the orbital parameters of the planet to identify orbits where known ETNOs were most stable. Trujillo (2018) found several planet orbits that would keep most of the ETNOs stable for the age of the solar system. To see if 2015 TG387 would also be stable to a distant planet when the other ETNOs are stable, we used several of the best planet parameters found by Trujillo (2018). In most simulations involving a distant planet, we found 2015 TG387 is stable for the age of the solar system when the other ETNOs are stable. This is further evidence the planet exists, as 2015 TG387 was not used in the original Trujillo (2018) analysis, but appears to behave similarly as the other ETNOs to a possible very distant massive planet on an eccentric orbit. Image: Movie of the discovery images of 2015 TG387. Two images were taken about 3 hours apart on October 13, 2015 at the Subaru Telescope on Maunakea, Hawaiʻi. 2015 TG387 can be seen moving between the images near the center, while the more distant background stars and galaxies remain stationary. Credits: Dave Tholen, Chad Trujillo, Scott Sheppard. Another interesting bit: There is a suggestion that ETNOs in retrograde orbit are stable. Given this, the authors do not rule out the idea that the planet itself might be on a retrograde orbit. The paper is Sheppard et al., “A New High Perihelion Inner Oort Cloud Object,” submitted to The Astronomical Journal (preprint). I prefer the name planet 9. Planet X reminds me of Nibiru. Anyway, Pluto fans aside, I find it interesting that there are still experts in the field that don’t buy into the new analysis of Brown and Batygins data and its detection bias. While I hope that planet 9 is out there, that would be a satisfyingly exotic addition to our solar family. B and B’s original theory has been pretty heavily battered. Lots to colonize right here in the solar system if we can survive the Great Filters, both the known unknowns and the unknown unknowns. I was thinking teh same thing. This wordlet has a mass of at least 5 peta MT, possible 25 peta MT. More than enough resources to maintain a space colony for a very long time. I could even see a colony buried beneath the surface in tunnels, slowly expanding living space while extracting materials. If the tunneling created levels 10 m apart, the total living area of the volume would be greater than the Earth. A huge source of fusion fuel for any putative starship as well, or power supply for a beamed sailship. I don’t really think you can layer colonies like that: You still only have the surface of the body to eject waste heat from, and you can’t dump any more waste heat from 10 layers of colony than you can from one. So, sure, you could have a lot of “living space” that way, but only so long as you weren’t actively using it for anything that produced heat. Increasing the amount of living space from a given amount of mass requires increasing its surface area; Building many O’Neil colonies, not multiple layers of colony on the original body. Shedding waste heat really isn’t a problem for bodies this far from the sun. If TG were warmed up to room temperature, it would be radiating 10^14 W — enough for a human population of several billion — of infrared from its natural surface alone, even without any artificial radiator structures. Could someone explain how it is that they do not know whether this object’s orbit is retrograde or not, given that we can see the direction of travel even in the two photos taken 3 hours apart? The authors aren’t saying that this object is in a retrograde orbit. They’re saying that their simulations show that retrograde orbits for ETNOs are stable, and thus we may find such objects in the future. I read all of this stuff about the Kuiper belt, Oort cloud, and the thousands of dwarf planets out there and I think, if anything, it really makes the case for O’neill style space colonization. Our solar system (and presumably all others) is far larger with a lot more “stuff” in it than has been assumed in the past. come from. a 500km ice ball impacting the earth would sterilize it. would cook any deep mine refuges. the moon would capture some of this debris, some quite large. It would not be just a navigation hazzard, but on the lunar surface, Lots and lots of impacts courtesy of earths rocky debris. What would the Earth look like a million years after impact. of Humanity’s works would be buried under hundreds of feet. Previous post: Kepler 1625b: Orbited by an Exomoon?